Provide independent shock absorption to individual wheels. Deal with humps in road surface, enhancing ride comfort. 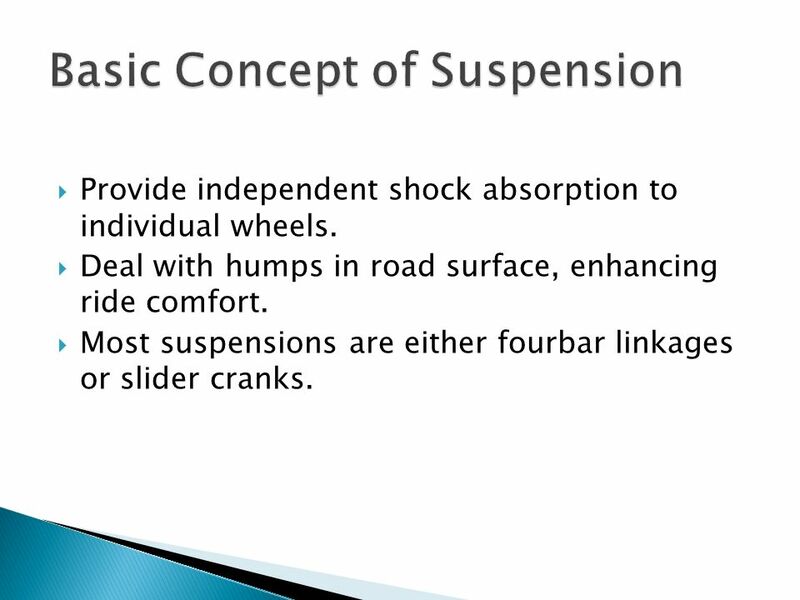 Most suspensions are either fourbar linkages or slider cranks. 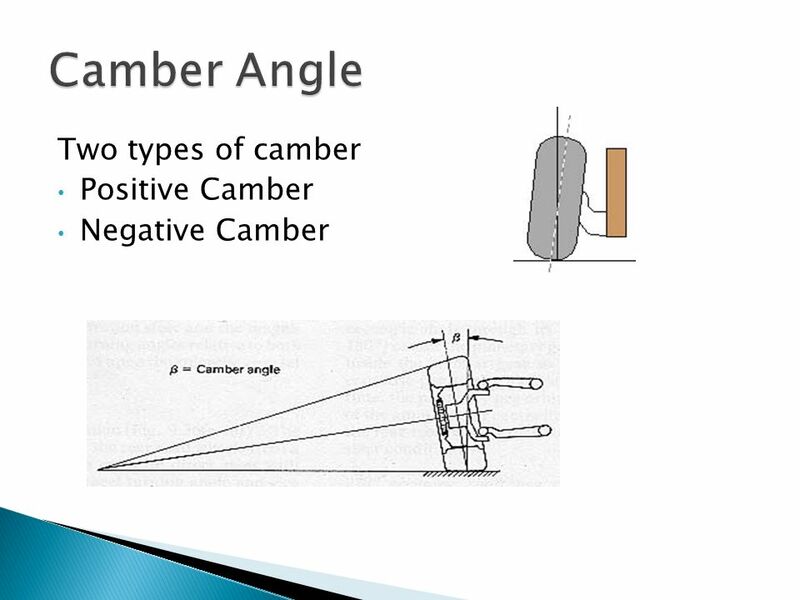 Camber angle is the angle made by the wheel of an automobile; specifically, it is the angle between the vertical axis of the wheel and the vertical axis of the vehicle when viewed from the front or rear. 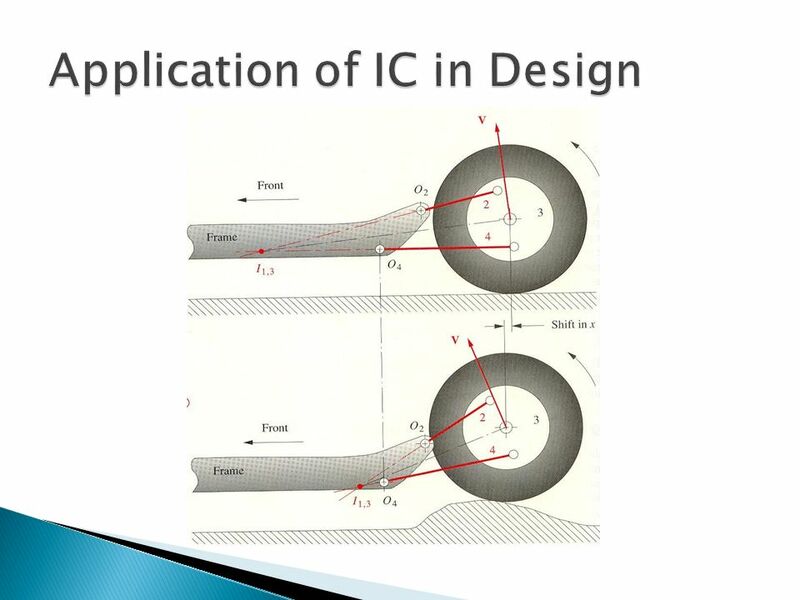 It is used in the design of steering and suspension. 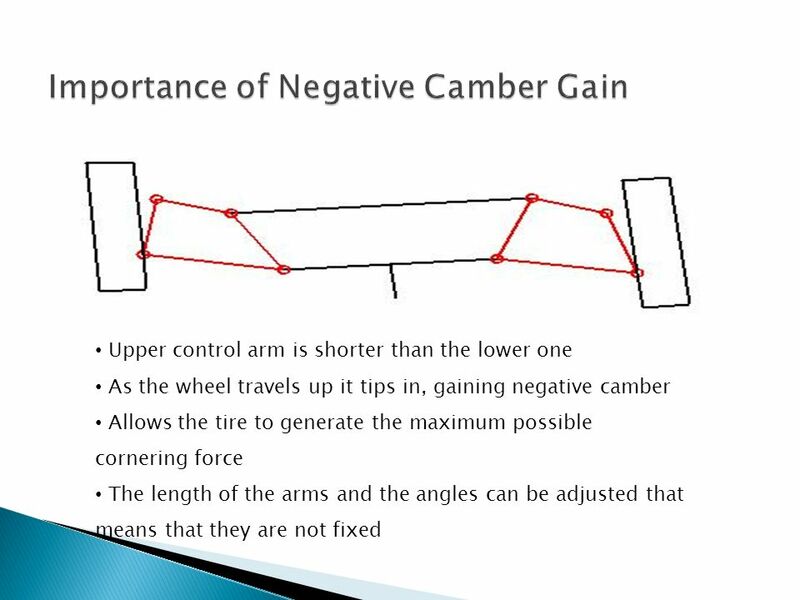 If the top of the wheel is further out than the bottom (that is, away from the axle), it is called positive camber; if the bottom of the wheel is further out than the top, it is called negative camber. Spindles to travel vertically up and down during bump and rebound. 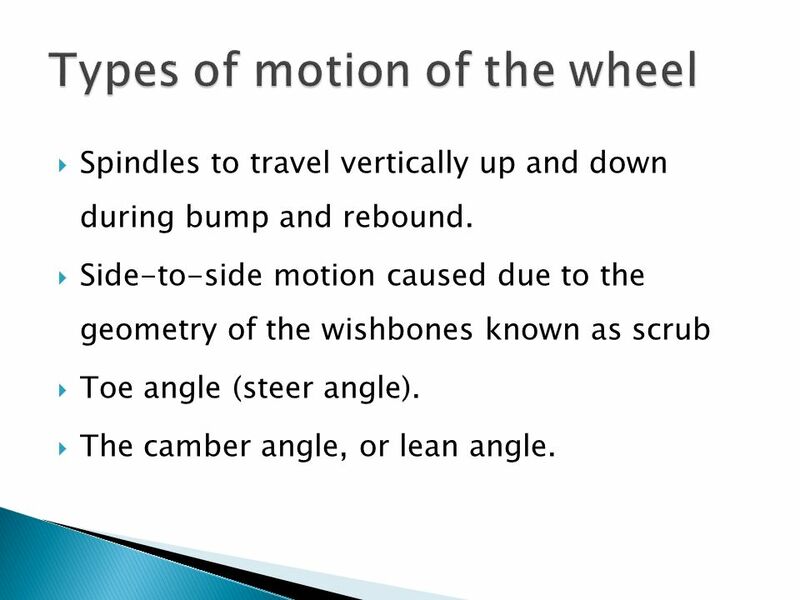 Side-to-side motion caused due to the geometry of the wishbones known as scrub Toe angle (steer angle). The camber angle, or lean angle. 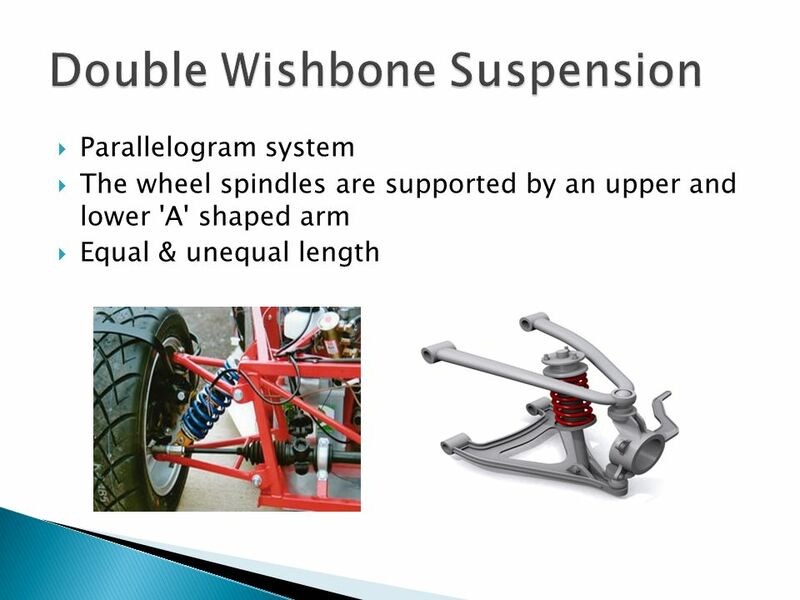 Unequal length double wishbone type. 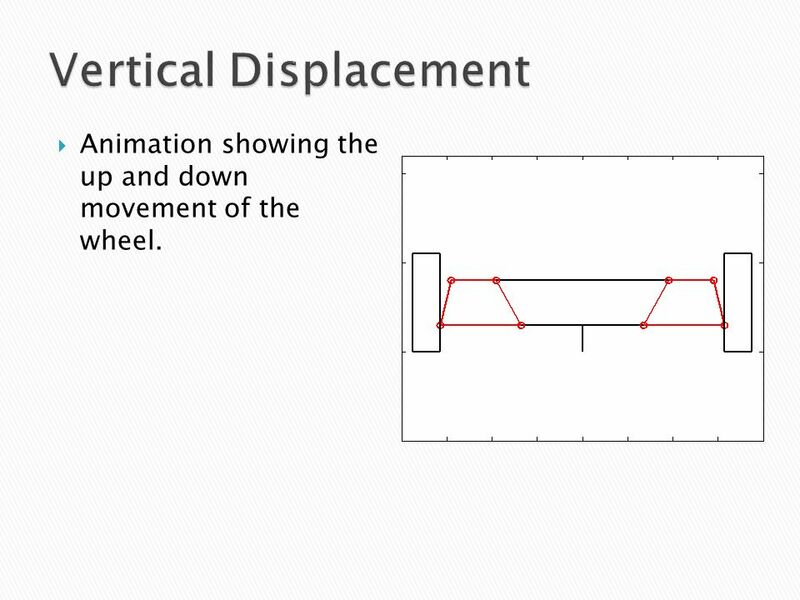 Animation showing the up and down movement of the wheel. 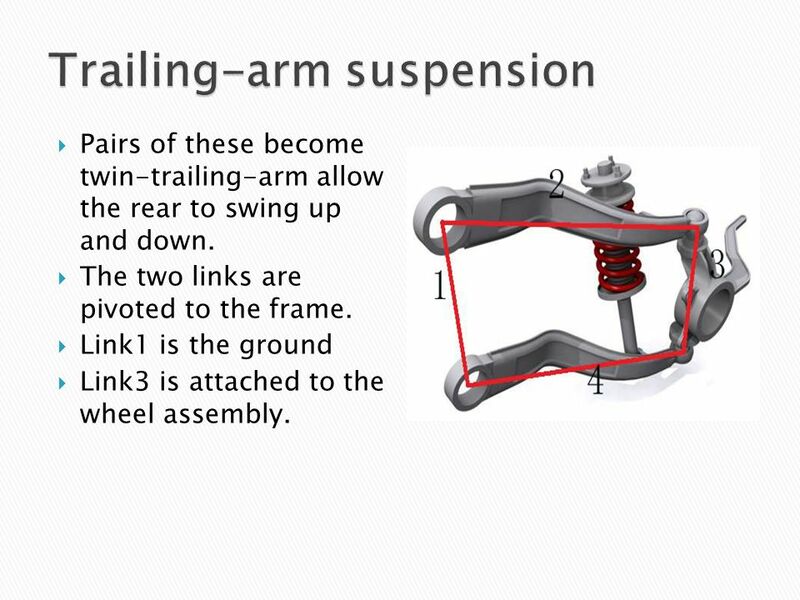 Upper control arm is shorter than the lower one As the wheel travels up it tips in, gaining negative camber Allows the tire to generate the maximum possible cornering force The length of the arms and the angles can be adjusted that means that they are not fixed By using an upper control arm that is shorter than the lower one, as the wheel travels up it tips in, gaining negative camber. This is because the upper arm swings through a shorter arc than the lower and pulls in the top of the tire as the wheel travels upwards. The advantage in this negative camber gain is that as the chassis rolls against the wheels, the increasing negative camber on the outside wheel helps keep the wheel upright against the road surface and allows the tire to generate the maximum possible cornering force. 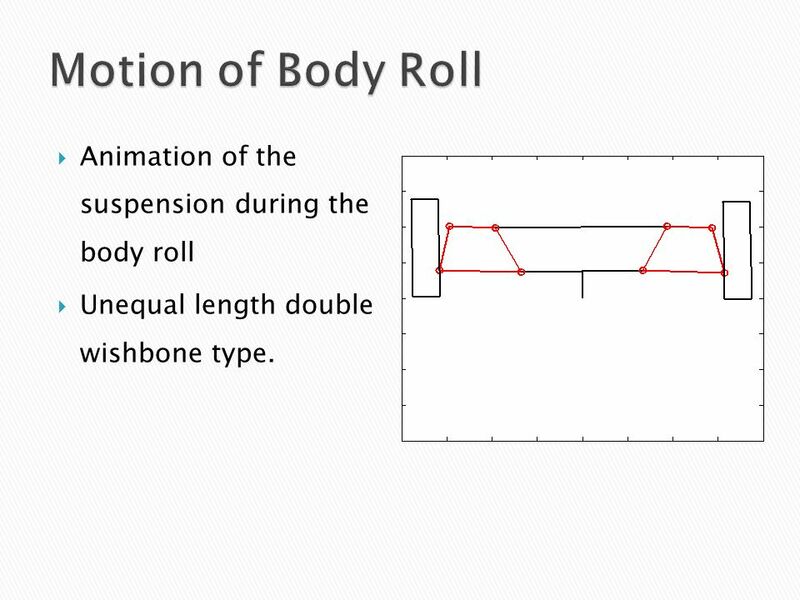 By adjusting the length of the arms and their respective angles to the ground, there are infinite possibilities in the design of a vehicles roll center height and swing arm length. 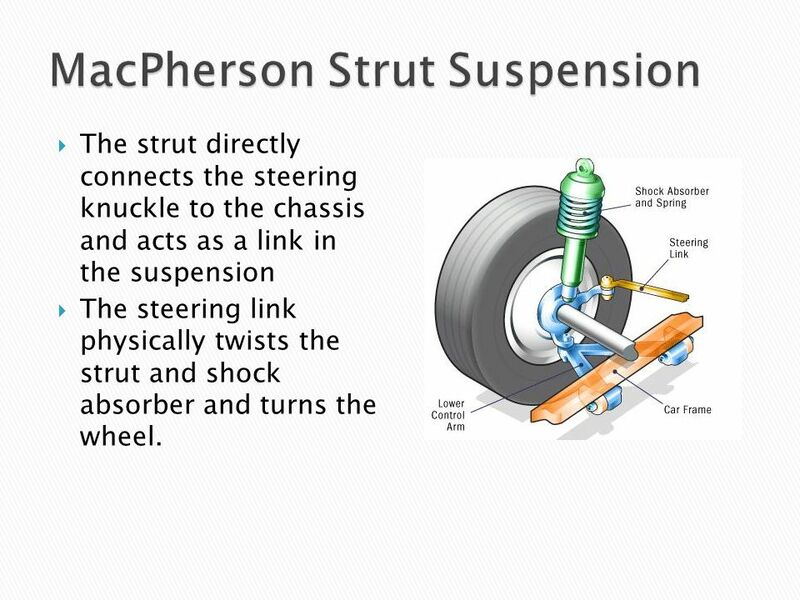 The strut directly connects the steering knuckle to the chassis and acts as a link in the suspension The steering link physically twists the strut and shock absorber and turns the wheel. Pairs of these become twin-trailing-arm allow the rear to swing up and down. 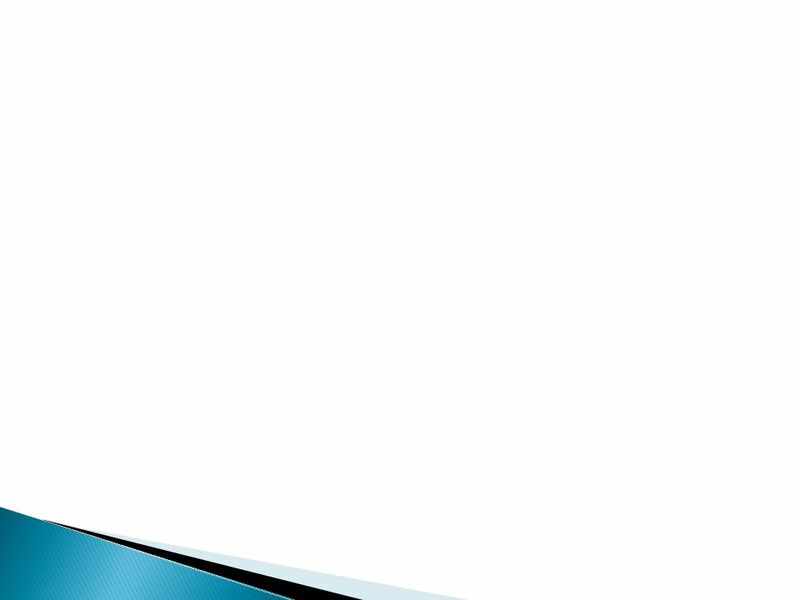 The two links are pivoted to the frame. Link1 is the ground Link3 is attached to the wheel assembly. Headquarters Air Mobility Command Enabling the “Global” in “Global Vigilance, Reach and Power!” Cornering 101. 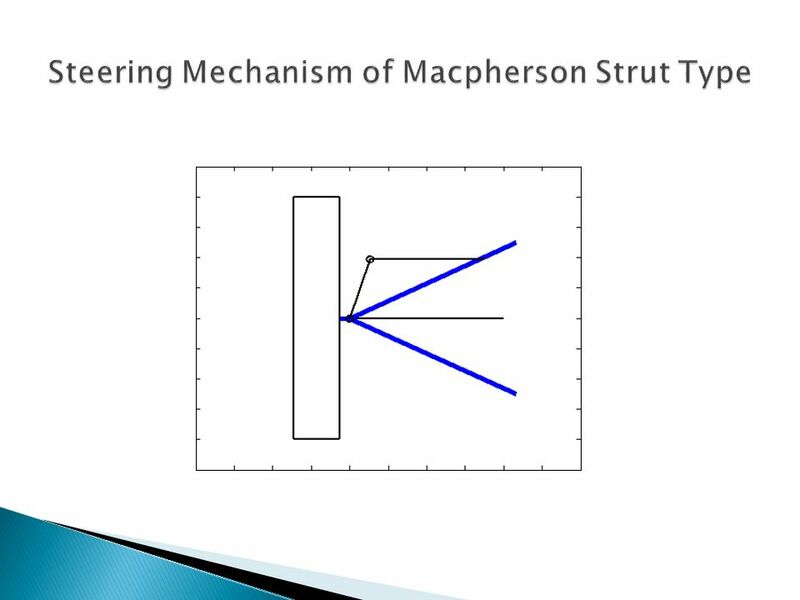 Rear Suspension Styles. CBC Auto JF Rear wheel drive. PACE Emerging Market Vehicle Suspension Design University of Cincinnati. 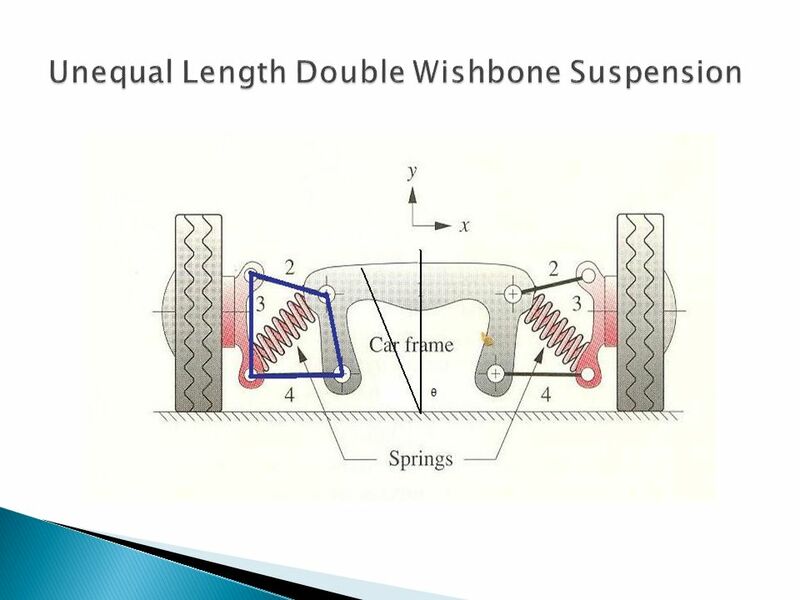 S USPENSION SYSTEM IN AUTOMOBILES. 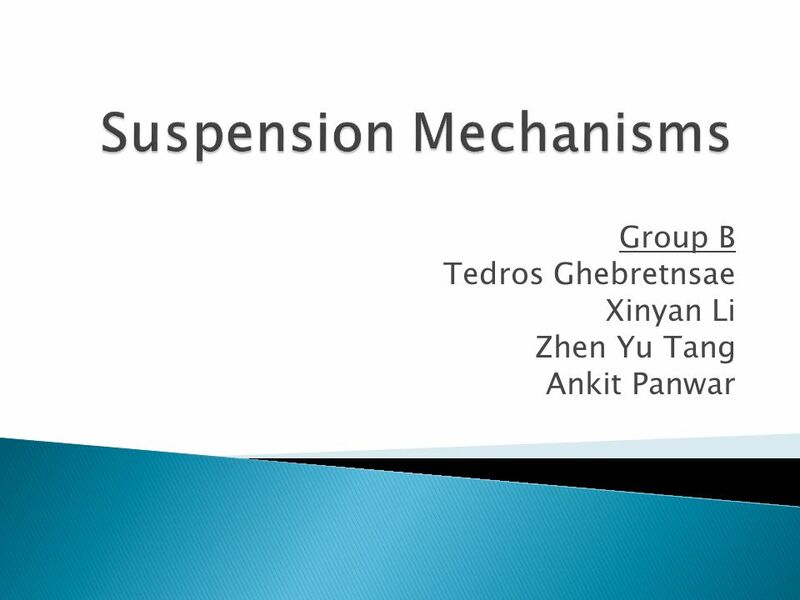 W HAT IS SUSPENSION SYSTEM Suspension is the term given to the system of springs, shock absorbers and linkages that. © Copyright 2011 Hunter Engineering Company Diagnostic Angles.